Pohlsepia mazonensis was named after the person who discovered it, James Pohl, and the location, Mazon Creek. It is the earliest octopod that has been described to date and is approximately 296 million years old. Up until the recent discovery and publication of Pohlsepia in 2000 it was thought that the octopus lineage stemmed from the vampyromorphs sometime in the mid Jurassic, so it is obvious how important this discovery was of a soft-bodied octopod from the Upper Carboniferous (Pennsylvannian) as it pushed the origin of the octopus group back at least 140 million years further. It is important to remember that Pohlsepia clearly had its own ancestors and even at this early date had clearly defined cirrate-octopus features. The true origin of the octopods must have happened a few million years before even this remarkable fossil. The fossil hails from the Upper Carboniferous deposits at Mazon Creek in Illinois, a source of extensive coal deposits. Many other cephalopods have been found in these deposits including nautiloids and the shelled torpedo-shaped ten-armed coleoid known as Jeletzkya. Specifically Pohlsepia comes from the Francis Creek Shale Member, this site of exceptional preservation consisted of rapid deposition of silt and sediments believed to have been at the mouth of a river delta where it met the sea. It is believed that storm surges following heavy rains swept masses of sediment down the river and out to sea burying coastal and marine animals and vegetation extremely rapidly. Concretions of ironstone then formed around the dead animals very quickly. Pohlsepia originates from the 'Essex' marine deposits and is preserved as a carbon film resembling a compressed stain inside one such nodule; this is typical for most fossils from Mazon Creek. 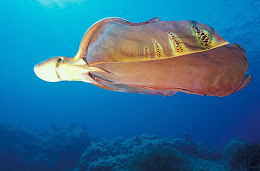 Just one example of Pohlsepia is known; as it is in a primitive condition the octopod actually has ten arms, two of these were modified but the other eight were approximately of the same length. The animal is small and is estimated to have had a Mantle Length of just 25mm long by 35mm wide. 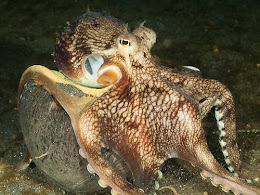 The animal lacks an internal shell much as with modern cirrate octopuses. The animal is sack shaped, has no clearly defined head and has very short arms. 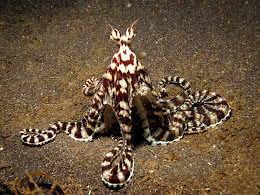 It also had two fins on its mantle, which are longer than they are wide, much like modern cirrate octopuses. 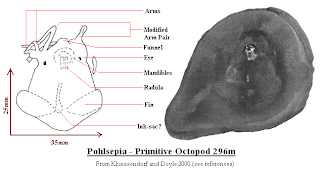 The fossil has been preserved in a ventral aspect, eyes, a funnel, mandibles and a radula are identifiable and there is an indistinct feature that may represent an ink sac (extant cirrate octopods do not have these). No arm hooks or suckers are present. Peter Doyle and Joanne Kluessendorf published the fossil in 2000 and they have concluded that Pohlsepia should be assigned to the order Cirroctopoda. Pohlsepia is housed at the Field Museum of Natural History, Chicago, Illinois. Nicholas Cage - A Cephalophile? The Octopuses of Burning Man!